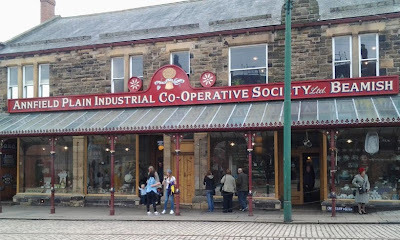 I was going to post today under the header "Treasure Chest Thursday" as I had planned to examine and scan a collection of papers passed to me by my mum at the last minute as I left her house on Sunday afternoon. I've been too tired to face the repetitive job of scanning until today, as you may have read in my posts over the past few days (here and here). However when I started going through the bits and bobs it struck me there was a very sad theme running through them. The letter from my aunt asking my grandfather if there was any insurance to cover the death of my great grandfather ... the dingy brown note from the Ministry of Pensions and National Insurance granting my grandfather £25 for the funeral of my grandmother in 1960. The pink Prudential Assurance payments book where my grandmother carefully paid 1/- (one shilling) a week towards her life insurance. The newspaper cutting reporting on my father's eldest sister's funeral in 1946 - when she was just twenty years old. An unexpected expense for the family at that time I'm sure. 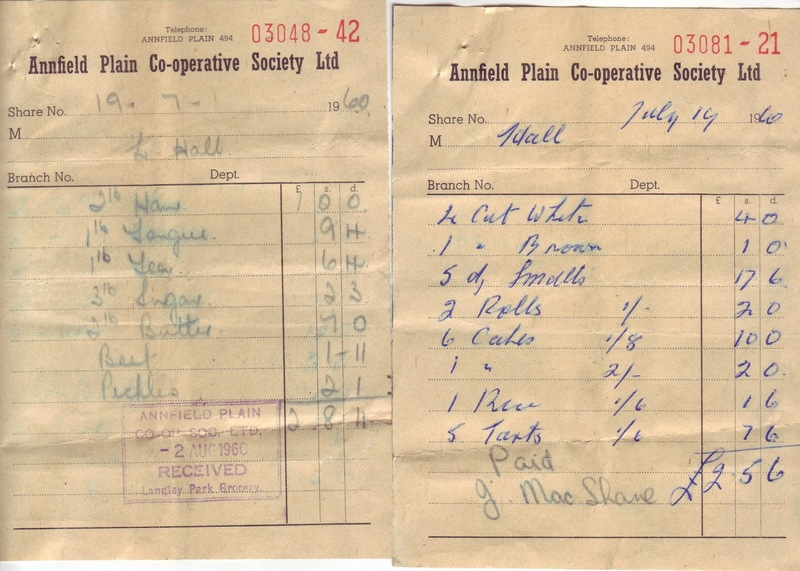 And in a separate envelope, fastened together with a still shiny pin, the various bills and receipts for my grandmother's funeral, including two bills from the Annfield Plain Co-operative Society for her funeral tea. I've chosen these items to illustrate my blog post today because they are the least personal items in the collection, and in a way, among the most poignant. My mum had married my dad the year before, my grandmother knew I was 'on the way' as my mum put it and that news had made her happy before she died. My dad and his surviving sister were only in their twenties when their mum passed away, and my aunt is still alive and may well read this post so do I want to make sure I don't say anything that could be at all construed as disrespectful. And as you can see from the back of the Death Grant form above £25 was the maximum payment, young people and for some reason people who were over a certain age when National Insurance came in (if I'm interpreting section (3) correctly) were entitled to far less. This suggests that the amount was dependent of contributions to a certain extent and I think implies that there was no means testing of the payment. I may be wrong ... this is not a very easy topic to Google and the papers of the Ministry of Pensions and National Insurance have not been digitised by the National Archives. It does look like it was one of those payments that was reviewed fairly frequently and possibly continued until the mid 1980s. 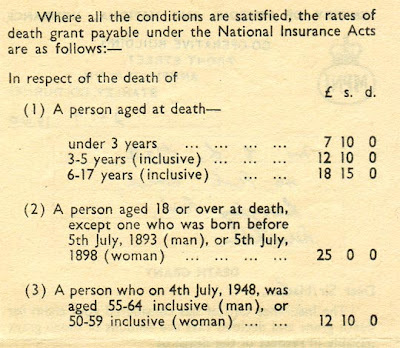 Of course any Death Grant was better than nothing, which would have been the situation prior to the expansion of National Insurance in 1948. This is no doubt why my grandmother paid her 1/- a week to the man from the Pru. 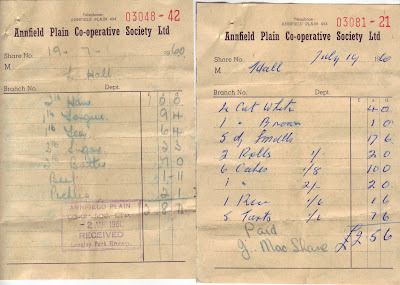 That paid out a reasonable sum to my grandfather according to the receipt in the collection, enough I think to cover the various expenses again if my adding of l.s.d (pounds, shillings and pence) isn't letting me down. 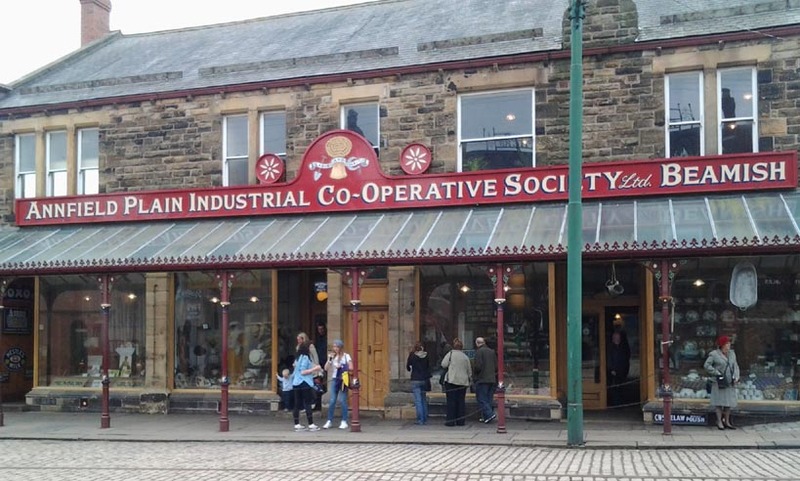 It looks as if my grandfather also had an account with the Pru, in the collection is a memo from them on much brighter paper with a coloured heading, well my grandfather survived his wife for another nineteen years and things had come on by 1979. I wonder what the Death Grant was then and if my dad, being fully employed at the time, was able to claim it? I hope my grandfather's insurance covered the costs - there are no further bits of evidence in the collection but my mum did recall my dad complaining that he had to pay an extra week's rent for my grandfather's council house as he "hadn't given notice of the death", erm, how exactly is one supposed to give a week's notice of a sudden death? So council bureaucracy hasn't changed then! All this made me wonder what happens today in this climate of benefit cuts and squeezing of the poor and middle classes. It seems I am not the only one to be worrying about this; the Citizens Advice Bureau have recently published a report on current Funeral Payments from the Social Fund and a leading financial advice website reports that the take up of pre-paid funeral plans is triple the number sold ten years ago. The average funeral today, according to the CAB, costs £3,284 and yet the average payment from the Social Fund is £1,241. Bear in mind that these payments are now only made to people on qualifying benefits, income support, income related ESA and JSA and so on, thus to the very poorest people in the country and I wonder how on earth they are expected to make up the shortfall? The option of a 'pauper funeral' so much mentioned by Dickens and on television programmes like 'Who do you think you are?' does not exist these days. For people whose income is just above the benefits threshold it must be much, much worse. They would have to bear the whole cost of a loved one's funeral, which, let's be honest here, no-one would want to skimp on, and as the CAB point out in their report is a "classic distress purchase", made in a rush with no time to shop around or think about the alternatives. Both my mum and my mother-in-law have invested in a pre-paid plan for their funeral arrangements, not only do they now not have to worry about whether their families will be able to afford the expense, but they also get to specify what type of funeral they want - a bit like putting it in your will I suppose. Looking at the various figures on the web I think the OH and I had better put some money aside for ours, when and if we ever sell the other house that is and have a few brass buttons to rub together - currently I think there might be room for us under the vegetable plot ... we can't afford a patio! I've been searching for days how to solve a problem with ' Don't track my own pageviews' after I started using a new laptop. Everywhere they give the same useless (for me) information. But now your explanation on the Google help forum about the cookie being blogspot.com instead of blogspot.co.uk solved it! All I had to do was remove the cookie so I would get a new one. Not too many people make the effort to share the solution when they solved a problem... So nice of you. History on the television - drama or documentary?